Diggers Valley: 28 January 2012. The week beginning the 28th of January 2012. 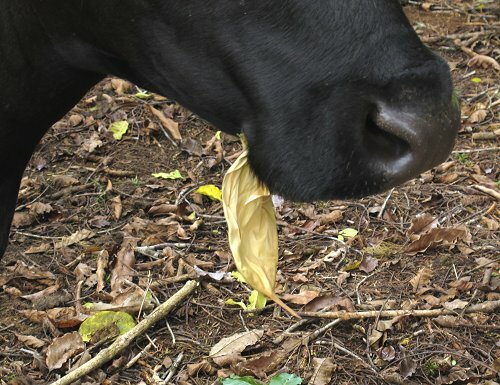 I couldn't work out what this was when I saw 546 with it in her mouth this morning, until I sneakily snatched it from her mouth - most of the cows will let me touch their bodies, but not their heads. I'm pretty sure it's the covering of the flower bud of a Nikau palm. I was busy playing with a new toy, a hand-held GPS unit with a clever aerial photo/map of the farm as we walked out this morning, so didn't notice the signs that not everyone was where they were supposed to be. 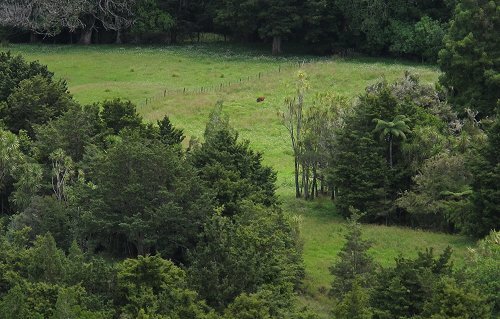 When I saw through the trees that there was a bull with too many fence wires in front of him, accompanied by a duet of bull growling, I realised all was not quite as I had intended. I sent #87 back in the direction of his mob of cows out in the Swamp paddock (where it transpired someone had left a gate open out into the lane after they'd finished fencing, and I hadn't realised or checked). 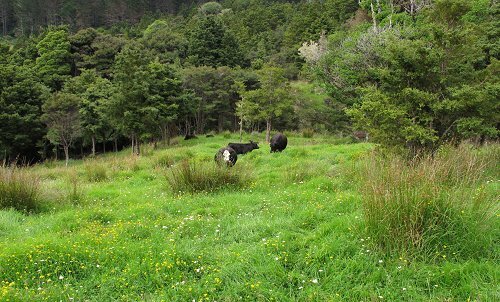 That's Athena on the left and bull #90 was staying under a tree for some reason; perhaps he felt he'd said all he needed to already. We make our visitors work! Not really, but it's always an option if our guests are so inclined. 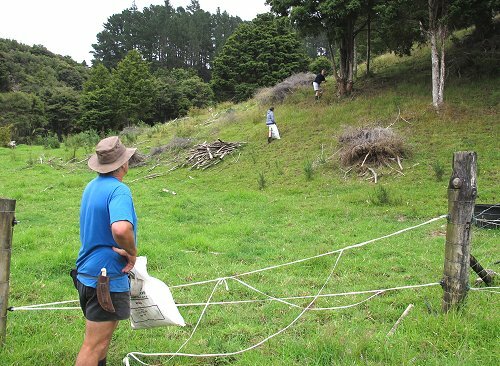 Sarah and Mike spotted the flowering ragwort and headed up the slope to gather the flowers and pull the plants. Stephan directed. 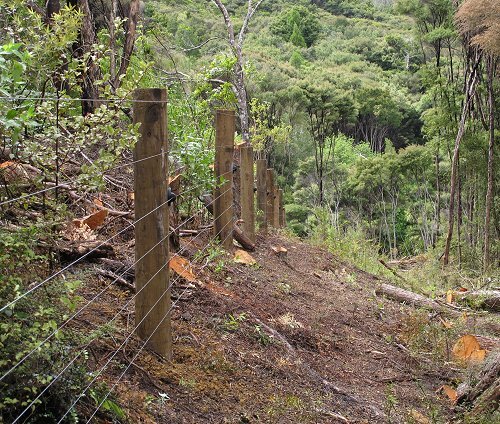 This is the new fence Stephan and Lance built along a small section of our northern boundary. It will need battens, but is vastly more secure than its predecessor. The one hot wire in the middle will discourage cows from putting their heads through the wires to browse whatever is on the other side and will stop the animals rubbing against the fence which would gradually push it over. We both hate having to make tree-felling decisions, but in retrospect are glad we went with the option of completely removing the large trees along the fenceline. It would have been a messy job to try and work around them. A definite keeper! This is 571's daughter and she's looked great since she was very small. 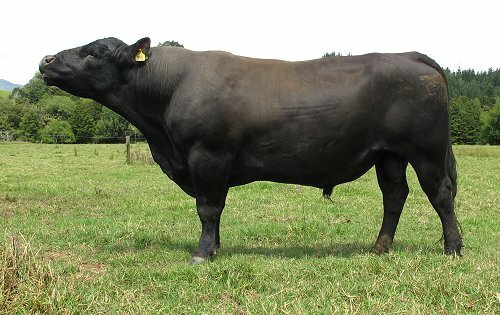 710 is one of the six daughters of #89, the bull who injured himself during mating last year and went to the works. They all look quite promising and since there will be no more of them, I'll keep them all for the time being. Metrosideros perforata, now flowering all around the farm. 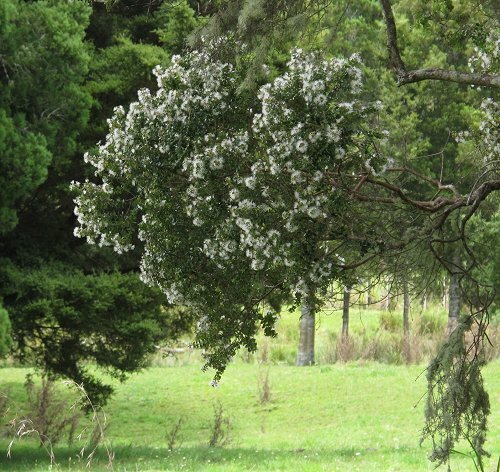 It grows (it's an epiphytic vine or a rambling sprawler on the ground) on most trees around the farm and poses no danger to the cattle who presumably keep it under control where they can reach it. 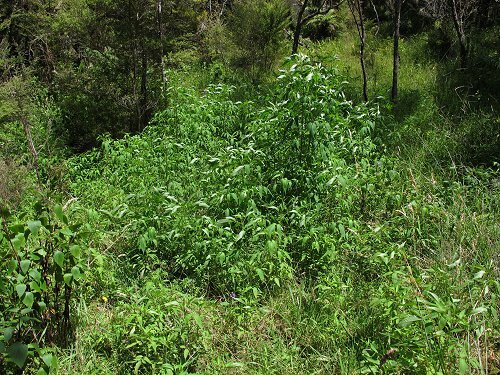 I met someone the other day who complained about it as a pesky weed, so if not regularly browsed, it would appear able to take over quite large areas of ground. The flowers smell like honey. Last time there was rain the rivers were up and I leapt across this stream with a spring gate around my waist, intending to put it across part of a lane on the other side of the high water - the cows could wade through safely, but it was a lot higher than my gumboots. I should have thrown the spring across before I leapt, but didn't think seriously about that until I felt the thing dislodge from my waist as I landed and grabbed the bank on the other side. 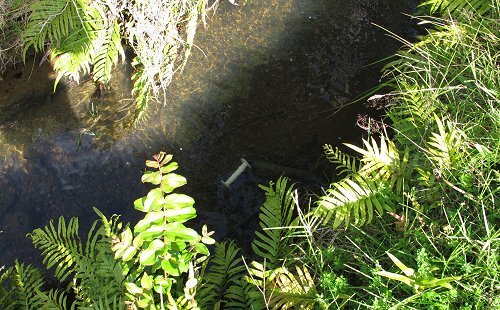 I imagined it would have been carried downstream in the rushing water, but hoped there was a chance it would catch on something and not go far. Thankfully that was the case and here it is! All that swearing and cursing my stupidity for nothing. Mike and Sarah took us out to dinner at the Beachcomber Restaurant, which they enjoyed just as much as on their previous visit. We all particularly enjoyed a trio of Salmon as our entrée, the cured Salmon being particularly delicious. 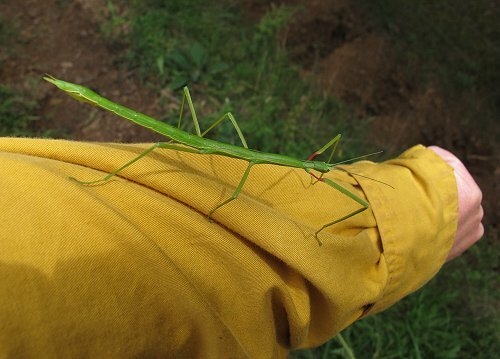 Out for my morning cattle check, I dashed up the hill to grab a couple of ragwort plants and as I worked, noticed an odd movement beside me: a very large stick insect had come off one of the plants near me and was wavering around on my sleeve. 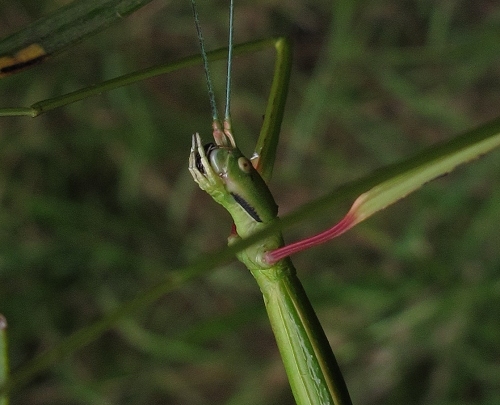 It is Clitarchus hookeri, the Common Stick Insect, presumably female. They live in and eat Manuka, which was probably the plant from which it brushed onto my sleeve. This particular vision really made me cross! That's our Road Flat Paddock and that is not our animal. It's one of the collection of manky little Jersey calves of unknown origin which keep being replenished on our 10-acre neighbours' property. So much for closed herds and biosecurity. The four of us had gone for a pleasant walk to the top of the hill over the road and were sitting relaxing and enjoying the view, when that little brown animal wandered into view. When we got home, Stephan, Sarah and Mike headed over to meet the neighbours to get the animals (there was another there too) back to their own side of the fence and fix up the displaced floodgate so they couldn't get through again. People who keep animals constantly on a fenceline should actually make it their business to ensure such boundaries are secure. The paddock is a pain to use because of the road access, so I'm going to leave it ungrazed now until we decide what else to do with it. I might get someone to mulch it some time, then leave it fallow for a year or so. I could also put my cull cows through it just before they go to the works, but that might not work in well with other plans. Maybe I'll find someone who wants to lease it for a gardening enterprise! I've been regularly checking 579's udder abscess which continues weeping pus. It seemed nearly healed over again this evening, but I gave it the usual squeeze and out popped this little piece of wood. It definitely came out from well inside the wound and there didn't seem to be anything else following it. It is possible that 579 caught her udder on a stick and that this piece pierced and remained inside, causing the abscess. 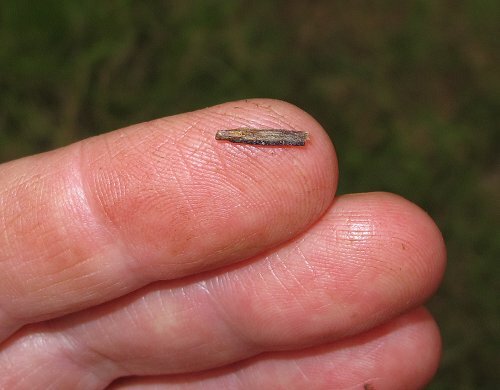 Because I'm writing about this a few weeks later, I can report that after the removal of the splinter, the abscess resolved and healed over completely. It being Sarah's birthday today, we had a celebratory dinner for her with a special bottle of wine. 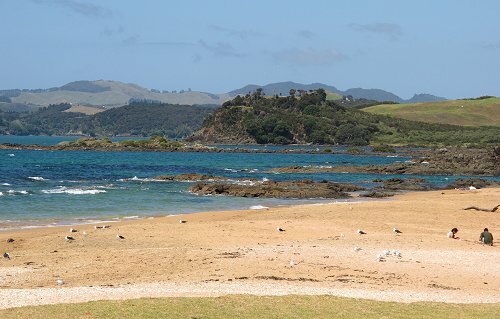 We all went over to Cable Bay for a swim - Maitai Bay was favoured, but the drive is so long and the day so hot. Besides, there's a very good icecream shop at Cable Bay. This is a view toward Coopers Beach and Mangonui, looking over Chuck's Cove, where I spent several years of my childhood in fascinated exploration of the rockpools. We all swam and the water was surprisingly cold. 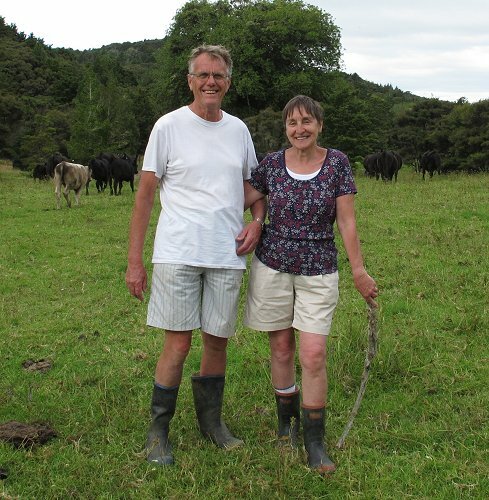 Mike and Sarah, on a walk to check and move the cows out of the Bush Flat paddock. Sarah and Mike headed off again on their travels early this morning. We had a lovely time with them and hope they'll be able to do it all again some time! This is 108's not-quite-detached scrotum. The thread is presumably the remains of some tendon. 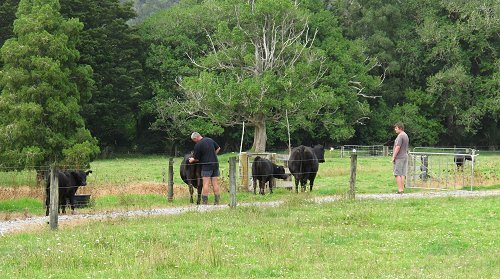 I had every intention of cutting the thread during the vaccination of the calves this afternoon, but in the rush we forgot to and the calves and cows were on their way out of the yards before I remembered, so left the job, hoping it would quickly resolve on its own. My "farming consultant" clients came out for a walk around the cattle today and sitting alone in the paddock while the others were all up and socialising, was 108. He was by now looking quite sore, so I headed him out of the paddock to the lane, intending to walk him back to the yards. Then as he climbed into and out of one of the grass-filled ditches grazing the deliciously lush grass, he somehow dislodged his swinging scrotum, so the need to take him in was averted. I hoped his stiff soreness was caused by inflammation rather than infection and that a rest would be better for him than a walk back to the yards. The largest patch of Beggar's Tick will need attention before the plants flower. 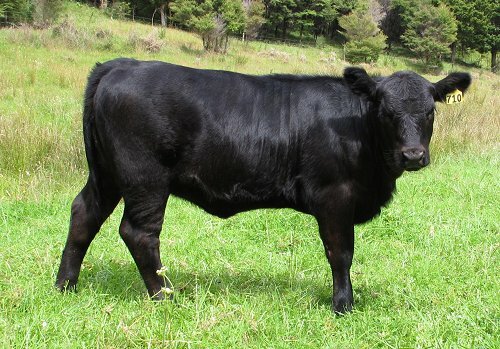 This afternoon I managed to draft #90 out of his mob and into the lane, then keeping him at bay behind a spring gate, moved the cows and calves out of his paddock and down to the Windmill Paddock with Athena and 108. Putting #90 back into the paddock alone, I did the same sort of thing with #87 and his cows, sending the second mob to join the first in the Windmill. 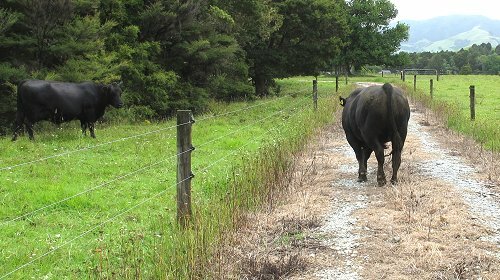 The two bulls were then alone in neighbouring paddocks and #90 had quite a lot to say about it! I've decided to keep the two bulls separate for the time being, because they were having some really violent fights before mating time and I don't want to risk injury to either of them. 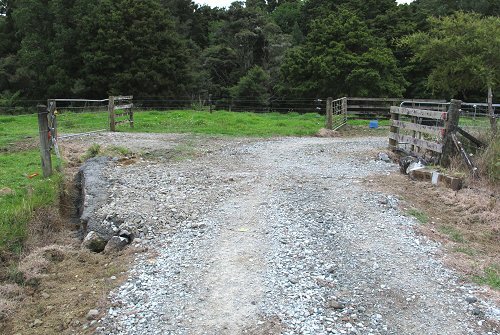 While I was away all day, Stephan and Lance did some concrete and block strengthening work to an extended culvert where the track turns a corner by the entrance to the Windmill Paddock. The fertilizer and metal trucks have to swing out so far they had crushed the end of the old culvert, so remedial work was necessary. Looking across the newly combined cow/calf mob, I could see one little body stretched out on the ground. By the time I took the photo he was sitting up, but his head's low and his ears weren't at their normal level, so Lance and I walked over to check what was up. It was 108 and he wasn't looking happy. The soreness I noticed yesterday had progressed to infection which needed treatment. We called all the cows to follow us down the lane to the yards in the fading light, and Stephan and I gave 108 a shot of Penicillin and left him and Athena in the yards for the night, with the other cows in the driveway for company. I'll have to keep them in close for the next few days while the rest of the mob goes out to the Big Back. 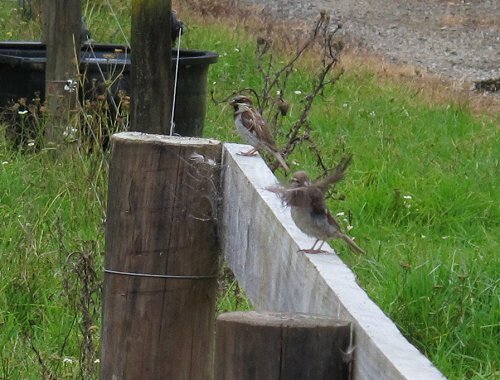 A pair of sparrows is building a nest in the roof of the milking shed. Stephan was watching them and said they dropped just as much as they carried - although I wonder if they were dropping it meaning to gather it again later when there were no people or cows around? 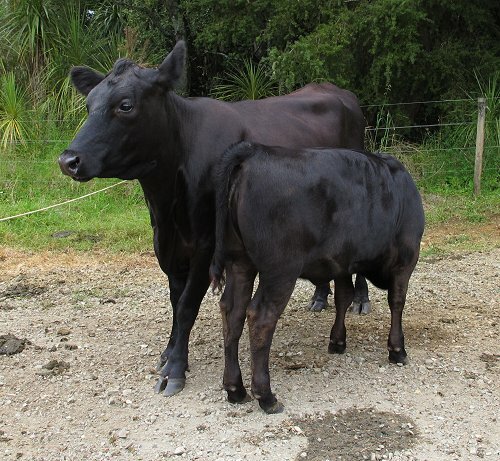 Zella's calf is doing very nicely, which is not entirely surprising, having two dedicated milk suppliers. Zella's alertness was due to her awareness of movement behind and to her left, as Lance approached along the track. Stephan, for a reason I can't recall, decided he needed to groom his cows on their way back to the paddock this morning, so took the brush with him. Lance watches and learns. Out the back since this morning, the cows and calves have found their various favourite spots, where it looks like they'll be able to be content for several days.